Latin American Technopoetics: Scientific Explorations in New Media analyzes the ways in which poetry and multimedia installations by six prominent poets and artists engage, and in turn are engaged by, scientific discourses. 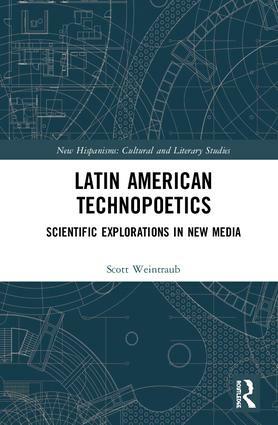 In its innovative readings of contemporary digital media works, Latin American Technopoetics is the first book to investigate the powerful dialogue between recent techno-cultural phenomena, literature, and various scientific fields. This cutting-edge analysis of poetic and artistic experimentation—robots that compose and recite poetry, algorithms that create visualizations of poetic language or of the connections between everyday language and scientific terminology, arrays of multi-dimensional poetic spaces, and telematic and transgenic art—makes a strong case for the increasing viability of a scientific poetics currently gaining prominence in Latin American literary and media studies, digital humanities, and science and technology studies. Scott Weintraub (PhD Emory University, 2006) is an Associate Professor of Hispanic Studies at the University of New Hampshire, where he teaches classes on 20th-21st-century Latin American literature, poetry, cultural studies, literary theory, and the relationship between literature, philosophy, science, and technology. He is the author or co-editor of over ten books and special journal issues, including two books on experimental Chilean poet Juan Luis Martínez; he has published extensively in journals and edited collections in the United States, Canada, Latin America and Europe. New Hispanisms: Cultural and Literary Studies presents innovative studies that seek to understand how the cultural production of the Hispanic world is generated, disseminated, and consumed. Ranging from the Spanish Middle Ages to modern Spain and Latin America, this series offers a forum for various critical and disciplinary approaches to cultural texts, including literature and other artifacts of Hispanic culture. Queries and proposals for single author volumes and collections of original essays are welcome.